This night will not be like the others: unmoving, the white moon bathes darkness with its unsettling paleness. Within the village's walls, the defenseless inhabitants shudder. From their nearby hiding places, the Beast-men of the Lord of the Nine Hells are getting impatient, goaded by the scent of human flesh. 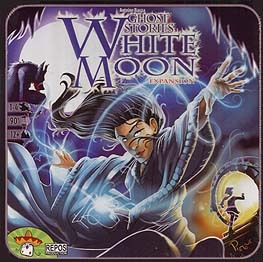 The Taoists will have their hand full and the help of the mysterious Su-Ling and her Moon Crystals will be most welcome... White Moon is an expansion for the Ghost Stories cooperative game.